Many items in our homes are made from metal whether functional like pots and pans or decorative such as tables, lamps and other types of furnishings. Most of these wear normally depending on the amount of use or activity and being indoors are not subject to the elements experienced outdoors. Our outdoor possessions that are made of metal are altogether different and tend to be more expensive items such as cars, motorcycles and off road vehicles. Less costly items including patio furniture, barbecues, fences, gates and garden decorations complete the adornment of your home. Yet, these products, no matter what the cost, are subject each day to the intense rays of the sun, pollutants in the air as well as the rain and show their wear and tear more quickly than those in an indoor environment. Exposed paint on metal is subject to peeling, chipping and cracking and loses some of its luster to the elements. Over time, the metal can be exposed and the overall appearance of your bicycle or car can become an eyesore. Electro Tech Coatings provides powder coating in San Diego and serves all of San Diego County and the surrounding areas. Boasting over 15 years of providing quality service to a wide range of customers, our growth has quintupled our staff from four employees to twenty and we operate two shifts per day. Our powder coating application is used to restore the brilliant finish of your metal work. We spray powder coating onto a grounded piece of metal and the resulting electrostatic charge creates an adhesion to the metal. Heat is then applied to ensure consistent powder flow and to enhance the curing process. There are over 200 color choices for you to consider and if for some reason we cannot match your color exactly, we will have it custom made for you. No product will leave our facility unless we are 100% satisfied with the quality of the work, and that assurance extends to the customer as well. Take a walk around your home and witness for yourself, the effects of the elements that have taken a toll on your metal possessions. 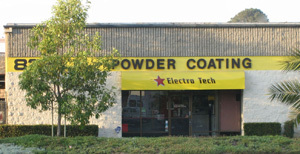 Choose an item that is especially damaged and take it to a top quality powder coating company….Electro Tech Coatings. The only potential downside is that once you see the quality and brilliance of your restored piece, a sort of addiction creeps in that sees you taking all of your metal pieces in to be refurbished to attain that brand new look. Contact Electrotech Coatings today at 1(760)746-0292.